Data Deluge: The fundamental dilemma of magnification. 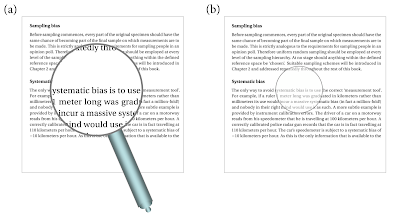 However, as a simple consequence of the design of the magnifying glass only the region of the text that is seen through the magnifying glass is at higher magnification. The physical edge of the magnifier therefore limits our view of the complete object. 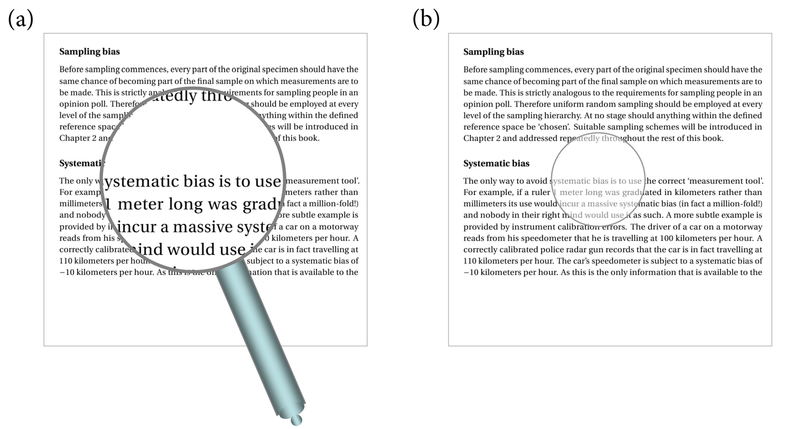 We see more clearly in the higher magnification observation window, but in total we see less of the text. The single fundamental act of using a magnifiying glass therefore introduces two separate consequences;  New insight and resolution within the observation window  an artificial observation window that represents a geometrical sampling of the whole object. Note that this dilemma is also true, but perhaps less obviously, for all practical optical instruments, such as cameras, microscopes and telescopes. By design they all have to impose an artificially limited observation window on the magnified view of the object or scene. The choices we make to try and deal with this dilemma are at the heart of the artistic and scientific techniques that rely on magnification or focusing of any sort.